Can you cut LED strips and solder them into shapes? Can I cut / snap the LEDS into individual smaller strips and solder them together to create a shape? If I can do this, does Paint Pattern treat it as one long continuos strip of LEDs? Or can it know the shape of the leds? First- yes, you can cut the LEDs into smaller lengths, however you'll need to solder the connections together, and the connections on the ultra thin strips are pretty tiny. Second- you can configure PatternPaint to work as a 2d grid, by going to tools->scene configuration, and in the fixture setting chose type 'matrix-zigzag'. You can then specify the width (number of strips) and height (LEDs per strip), then you can show 2d images on the display. 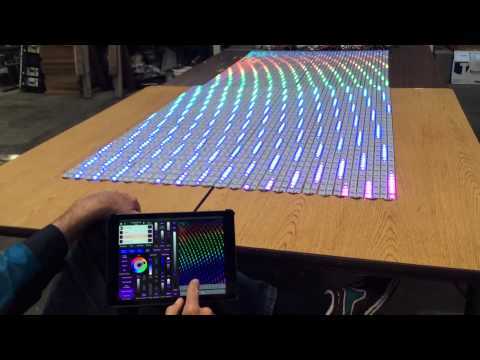 Can I chain several Blinky 8x8 Matrixes to make a 32x32 panel and use PatternPaint with it? If not, can I use Pattern paint and a Blinky control tape board with another 32x32 panel? They come with a BlinkyTape controller soldered to the input side, and with a JST connector soldered to the output side. To chain them together, you'll need to remove the BlinkyTape controller from the second, third, and forth matricies, and then solder wires between the 5V, GND, and DOUT connections on the first pad to 5V, GND, and DIN on the next matrix, and so on. It's probably easier to get a generic 16x16 panel and connect it to a BlinkyTape controller. A 32x32 panel starts needing a bit more power and processing speed than the BlinkyTape controller has- it does support up to 512 pixels, though you will certainly need to add a beefy 5V power supply.